This article has been curated from "Coins Left Over" by Eugene Strite. Buy it from the eGen store by clicking here. The collapse of the Soviet Union in the early 1990s brought upheaval into the lives of millions of Europeans. Euphoria over newfound freedom quickly mingled with fear of the breakdown of social order. Hope for the future was tempered by uncertainty over the present. Triumph or tragedy, everyone had a story. One young man, an artist, struggled for nearly two years to survive as a beggar on the streets of an eastern European city. One day, moved at the sight of two other beggars in similar circumstances to his own, he counted out the biggest coins he had and divided them between the two. Soon after this, someone bought not one, but two, of the lovely little paintings he was selling. This was the beginning of his rise out of poverty. What made the difference? Reflecting on what had happened, the young artist remembered reading Jesus’words, “Give, and it will be given to you…”(Luke 6: 38 NKJV). It was then that he realized the true value and power of giving. In fact, giving is the most important principle for achieving success God’s way. Does that surprise you? Do you find it hard to accept the idea that a key to establishing financial success in your own life is learning to give away your financial resources? Conventional wisdom in the world would say otherwise, but the world’s wisdom is different from God’s wisdom. “For My thoughts are not your thoughts, nor are your ways My ways,”says the Lord. “For as the heavens are higher than the earth, so are My ways higher than your ways, and My thoughts than your thoughts”(Isaiah 55: 8-9 NKJV). All things belong to God because He is the Creator of all. His Kingdom is an infinite Kingdom with infinite resources that can never be exhausted. Those resources are available to every Christian who is willing to apply and live by God’s financial principles. As we learn to give as God has blessed us, we discover also that no matter how much He gives from His storehouse, He never runs out; hence, neither do we. There will always be just as much as there was before. The road to financial success begins with adjusting our mind-set to think in terms of God’s economy, not man’s. Giving is risk-free when you draw from an infinite supply. As counterintuitive as it may seem to a “rational” human mind, giving is a fundamental principle in the economy of God’s Kingdom. Another word for money is currency. Related to the word current, currency carries the idea of movement, as with water in a river—something that flows. And just like water, money that does not move becomes stale and stagnant. It needs to move frequently in order to remain fresh and productive. As Christians, we are to be channels through which the finances of the world flow, not people who hoard money. Why should we hoard money when we are heirs to the infinite riches of God? The Spirit Himself testifies with our spirit that we are God’s children. Now if we are children, then we are heirs—heirs of God and co-heirs with Christ, if indeed we share in His sufferings in order that we may also share in His glory (Romans 8: 16-17 NIV). Whenever you are afraid or selfish with what God has given you, you stop the flow. You create clogged pipes, making it hard for finances to come back to you. The way to get the flow going again in your life is to start giving. Open the valve; be generous! Give extra tips. Make a deliberate choice to bless others and then watch what happens! One man gives freely, yet gains even more; another withholds unduly, but comes to poverty. A generous man will prosper; he who refreshes others will himself be refreshed (Proverbs 11: 24-25 NIV). Giving does more for the giver than for the receiver. Indeed, Jesus said, “It is more blessed to give than to receive”(Acts 20: 35b NIV). Giving and receiving are in fact two sides of the same coin. People often ask me, “Should we tithe on the gross or on the net income of our paychecks?”Giving is an issue of the heart. It’s not a question of percentages. The joy of giving exceeds the law of giving ten percent. The law was cancelled in Jesus Christ. How much you should give really comes down to the question of how large a harvest you want. The key to establishing financial success in your own life is learning to give away your financial resources. Paul instructs us, as he did the Corinthian church, to make sure that we excel in the grace of giving. But just as you excel in everything—in faith, in speech, in knowledge, in complete earnestness and in your love for us—see that you also excel in this grace of giving (2 Corinthians 8: 7 NIV). Although personal benefit should never be our primary motivation for giving, Jesus makes it clear that generosity in giving brings back abundant returns to the giver. Give, and it will be given to you: good measure, pressed down, shaken together, and running over will be put into your bosom. For with the same measure that you use, it will be measured back to you (Luke 6: 38 NKJV). One of the reasons God blesses us with finances is so that we can share with those who are less fortunate than we are. Giving can be a very enriching and rewarding experience. Every believer, regardless of his income, should learn to be a giver. Giving is the best way to keep material things in the right perspective in our lives. God doesn’t need our money, but we need to give as a guard against greed and selfishness. Sharing with others helps keep our heart in the right place. Giving is risk-free when you draw from an infinite supply. 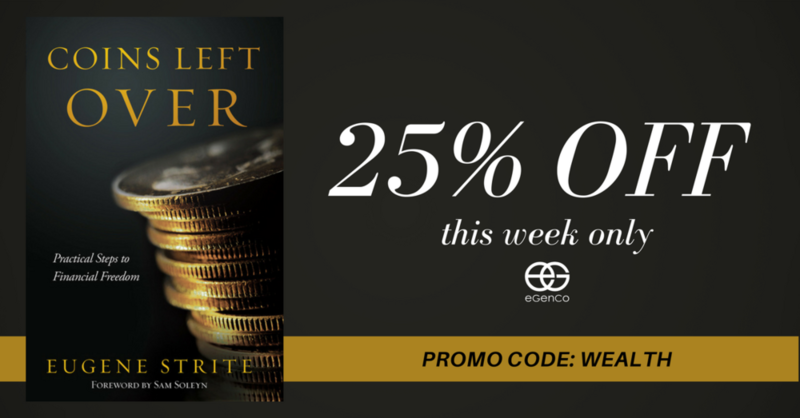 You can purchase your copy of "Coins Left Over" by Eugene Strite in the eGen store. Just click here or click the image below. This week only (1/16/17-1/21/17, 11:59, EST) you'll receive an extra 25% off at checkout when you use promo code: WEALTH.